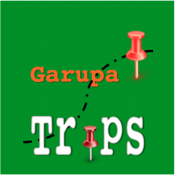 "Garupa Trips" is an App to share with your relatives and friends your location during a trip. - Just click "Create new trip" and you will receive a CODE to share with your relatives or friends. - Your location is sent to the server periodically. Only people who have the trip code can view the map with your locations. - Everyone who has the code and an optional password can follow your steps through the internet.